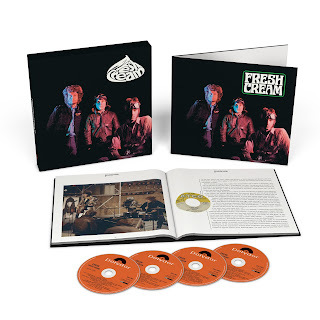 Late January 2017 sees the deluxe edition release of "Fresh Cream," the debut album by British, blues boom, power trio, Cream. The 3-CD + 1 Blu-Ray Audio disc come housed in a gatefold sleeve within a rigid slipcase and includes a 64-page hardback book, featuring new sleeve notes by respected Rolling Stone writer, David Fricke. The set comprises various alternate and new stereo mixes plus several, previously unreleased BBC sessions. A special 6LP 180g Vinyl edition of "Fresh Cream" will also be released in April 2017. Originally released in 1966, at the height of the UK blues bloom, "Fresh Cream" showcased the not inconsiderable talents of three of the then music scene's brightest lights: Eric Clapton fresh from John Mayall's Bluesbreakers; drummer, Ginger Baker straight from the Graham Bond Organisation and versatile bassist and musician, Jack Bruce who, at the time, had just left Manfred Mann. Collectively the three had decided to give up their roles as much sought after sidemen to form their own super group. Coming together as Cream in the early summer of 1966, the trio moved at impressive speed to make the release of "Fresh Cream" in December of the same year. Highlights include the racing harmonica work-out and the call and response excitements on Muddy Waters' Rollin' and Tumblin', a spine-tingling vocal on the Willie Dixon classic, Spoonful, as well as the self-penned Sleepy Time Time, which gave Clapton a free hand to wake up all and sundry. Their rousing treatment of the traditional standard, Cat's Squirrel alerted listeners to just how well Clapton, Baker and Bruce musically complemented each other.